Henry Holt and Co. (BYR), 9780805096897, 256pp. For Rob Burnside, things are going pretty well. His friends are behaving, school isn't too bad, his family's getting along, and Janae, the girl of his dreams, occasionally notices him. Yep, life's okay—until the lying starts. Meet Pinocula, the new creature from Rob's closet. He is a liar and a jokester and is determined to drive Rob crazy. Obert Skye doesn't let his fans down in this hilarious installment in The Creature from My Closet series, which started with Wonkenstein and Potterwookiee. 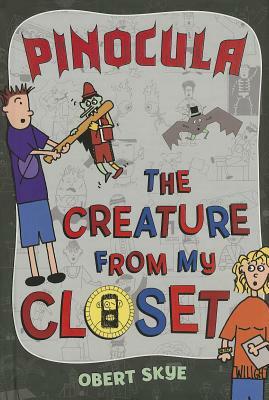 Obert Skye is the author and illustrator of The Creature from My Closet: Wonkenstein. He has also written the bestselling children's fantasy adventure series Leven Thumps and Pillage.